Hollywood is where even the wildest dreams can come true no matter who you are, where you come from, or even what you know. In Hollywood, everyone is a potential star and newsstands overflow with gossip about the latest celebrity mishaps, conflicts, and achievements so that millions can live vicariously through the lives of their favorite movie stars. Starting today, you no longer have to live through the gossip news of your favorite celebrities because you can turn your own life into the same star-driven celebrity marketing machine through The Fame Game. Seen through the eyes of an experienced Hollywood talent manager, The Fame Game will guide readers past the carefully crafted public relations images splashed across the pages of their favorite gossip magazines to reveal how today's hottest celebrities live, thrive, and flourish in the glamorous world of show business where the cameras are always on, the fans' gossip ricochets through all the popular social media networks, and the money flows in multi-million dollar deals based on nothing more than notoriety instead of talent. If you want to learn how Hollywood really works and how you can use the techniques of show business to market yourself into the next Hollywood sensation or just to promote yourself within your own line of work, you need to learn the secrets told in The Fame Game. This book will rip away the mystery behind the glitzy world of celebrities and expose the deliberate strategic planning designed to maximize the social and cultural impact of celebrities such as Elizabeth Taylor, Michael Jackson, Angelina Jolie, Charlie Sheen, the Kardashians, the Hiltons, the Olsen twins, Britney Spears, Jennifer Lopez, Justin Bieber, the Real Housewives of Beverly Hills, along with The Situation and Snooki from Jersey Shore. The authors of The Fame Game know how many of these stars turned their fame into fortune because the authors are the masterminds behind some of today's biggest celebrity brands and business empires in the history of show business. The Fame Game will reveal the carefully constructed scaffolding behind celebrity branding and show how the public lives and images of today's top celebrities are a deliberate strategy and intricate dance between celebrities, the media, the general public, and the big business interests directing the ultimate movie called Life in the Spotlight. 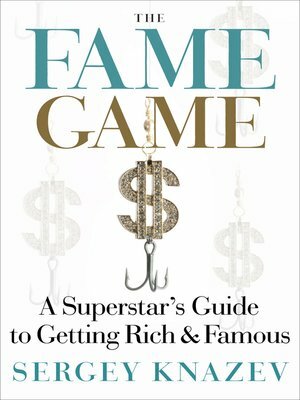 While the huge fan base of celebrities will enjoy reading The Fame Game for its fascinating stories about their favorite and most hated celebrities, entrepreneurs, marketing professionals, and business students will enjoy The Fame Game as a unique textbook, survival guide into the new world of digital media and social networks. Most importantly, kids with their own big dreams of conquering Hollywood will find The Fame Game a book of empowerment that provides concrete steps they can take to turn their own dreams of fame and fortune into reality.